The organizers are proud to reveal the LpS 2017 program, for what will be the greatest LpS event to date. Over 1,600 delegates and 100 exhibitors will come to Bregenz this year, including global experts from industry and research. The event focus will be on multiple lighting applications such as Human Centric Lighting, Transportation Lighting, Agricultural Lighting, Healthcare and many more. These chosen specialists will be sharing their future visions, innovative technologies, trend insights and research findings in over 100 carefully selected lectures. “We have been building up to this for 7 years; LpS 2017 will be something truly special! We are bringing together the very best minds in light, from industry and research, for what I believe will be 3 unforgettable days that will explore and develop the light technologies of tomorrow,” Siegfried Luger, Event Director. Highlights this year will include keynote lectures on prominent trends. Delegates will hear from the world’s foremost expert in Solid State Lighting, Fred Maxik, and industry trailblazer Jan Denneman, Vice President of Philips Lighting, who will be sharing his visions on “Connected Lighting – A Global View”. Additional sessions will also cover laser lighting, future markets & trends, Human Centric Lighting, light sources and modules, intelligent lighting, IoT and security, materials and components, system qualification and applications. 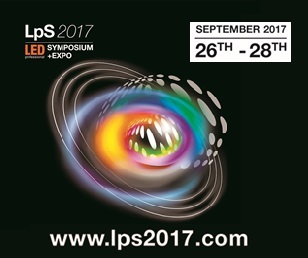 Hands-On: LpS 2017 offers its attendees the chance to get hands-on and to explore light, and its possibilities. With a series of detailed and informative workshops delivered and lead by such internationally renowned companies and organizations as EPIC, Photonics21 and Bluetooth SIG on subjects including Miniaturization, LiFi, and the potential of Bluetooth and IoT. Award Winners: The very best technology, products, equipment or services at LpS 2017, one that demonstrates uniqueness, sustainability and the highest-quality in the field of Solid-State Lighting, will be honored with the coveted LpS Award. LpS 2017 Program hosts high quality conferences and top lighting industry exhibitors. LpS is the leading international lighting technologies event for design, testing and production of lighting systems, controls and equipment, showcasing state of the art lighting designs and products. The conference has a long heritage and a trusted reputation for being the event that brings together the very best light technologies experts from around the world and has also received the Austrian Congress Award 2017. Europe’s Leading Lighting Technologies Event Over the recent years, the LED professional Symposium + Expo has established itself as the European point of reference for lighting professionals dealing with the development, production, measurement and evaluation of modern solid-state lighting systems and controls and its latest technologies in various application areas.